Today I'm popping in to show you the mini quilt I made for my partner, Debbie, for the Bonnie and Camille Barn Quilt Swap (#bcbarnquiltswap on Instagram). Now, if you're a bit confused - yes I know a barn quilt and a mini aren't the same. 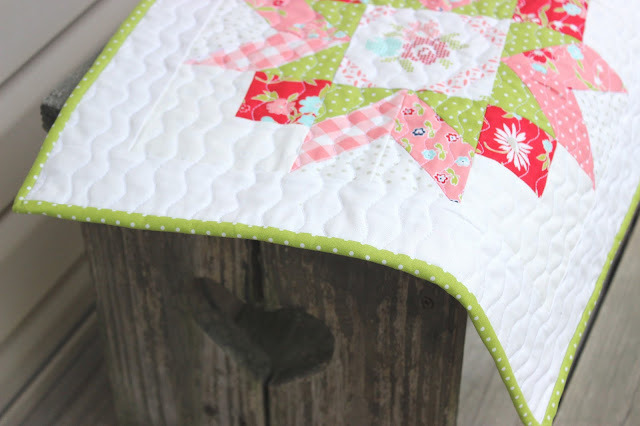 Barn quilts are typically star blocks that are painted on wood. 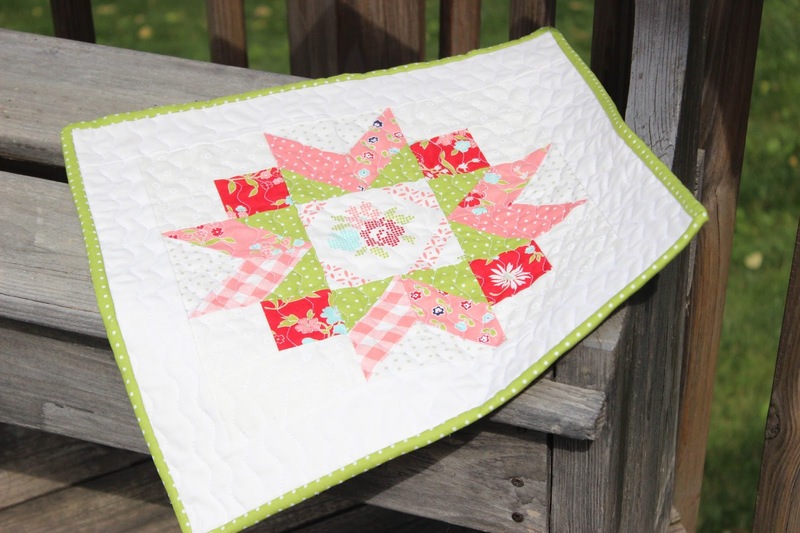 However, for this swap the theme was to create a mini anywhere from 12" to 20" in the barn quilt style blocks. I chose prints from Bonnie and Camille lines: Vintage Picnic and Hello Darling for the binding and the star block, and a neutral floral print from Miss Kate for the back. 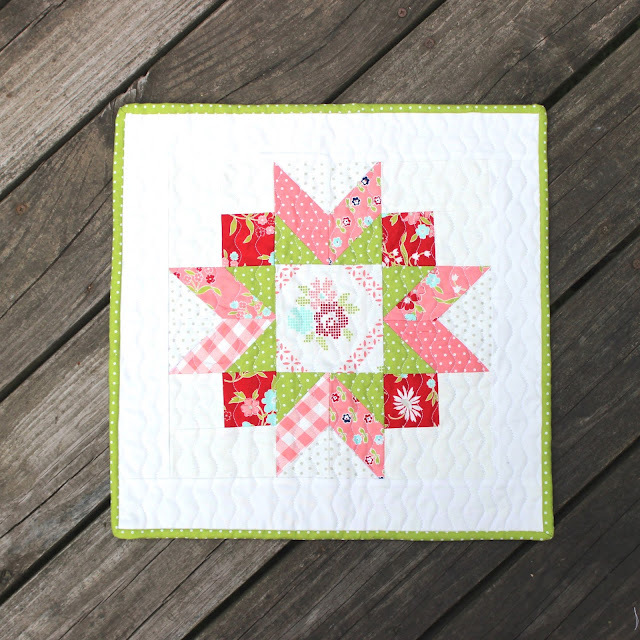 The block is a 12" Winter Star block from the Farmgirl Vintage book by Lori Holt. 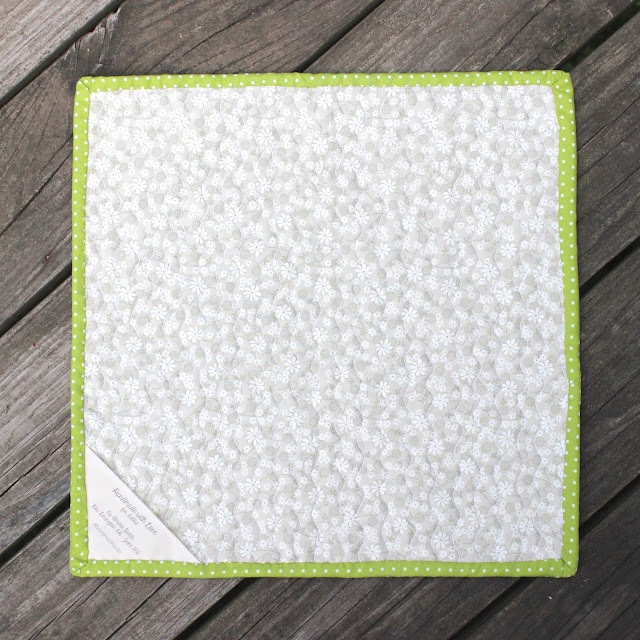 I simply added a wide white border each side (Kona solids in Snow), which finished the mini quilt at 16" x 16" square. Also - how cute is that bench up there with the heart cutouts that I inherited from my grandparents? I have matching set of two small benches and one large bench with a back on it. Love them so much! I tacked the binding down on one side with my machine, then folded it over to the next side and held with binding clips so I could finish it off by hand. I LOVE the look of hand sewn binding. I chose to do wavy line quilting approx. 1/2 to 3/4" apart across the entire quilt. 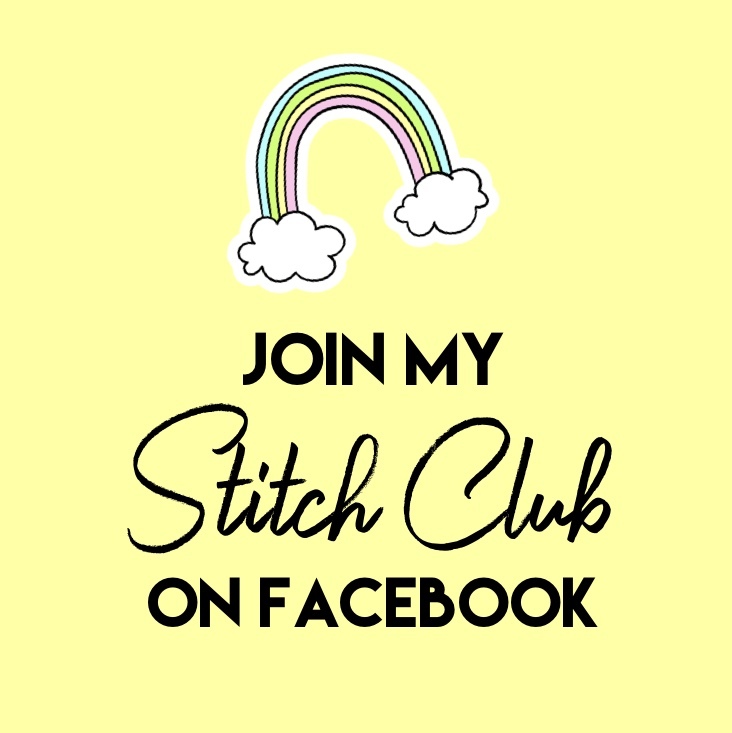 This particular stitch is preloaded onto my machine and it really comes in handy! I haven't tried my hand at FMQ at all so although I would have loved to do a pretty design on this mini, I just don't have the skills or tools necessary! The tag on the back is printed from my computer onto fabric, and it was actually super easy!! I used the method Erin (mommy2lu) talked about on instagram a while back and had great results. I created a 5"x5" square on my computer, divded it in half with a line (like a HST) and typed in my info on one side. Once it was printed using Erin's method I cut it out, folded it into a triangle and gave it a quick press. I basted it into one corner of the mini on the backside, then put my binding down to finish it off and secure it. Debbie - I hope you loved your mini as much as I loved making it! This was my first ever mini quilt swap and I am totally smitten! Swaps are so addictive and its a great way to make friends :) I love getting something handmade by someone else from another party of the world. Its so awesome! 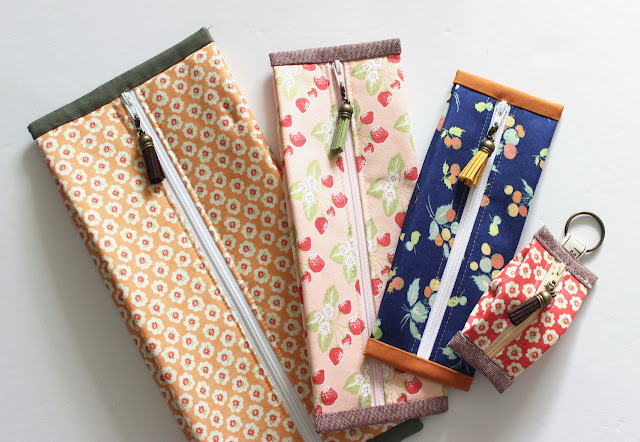 Have you ever made a mini quilt or have you been in a mini quilt swap?? What was your experience? 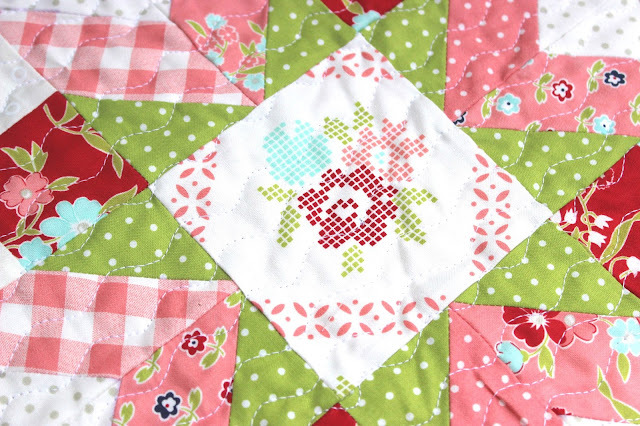 This is lovely Amista - and such a speedy finish too! Will have to bookmark that tutorial because I haven't yet got round to printing on fabric. Thank you! 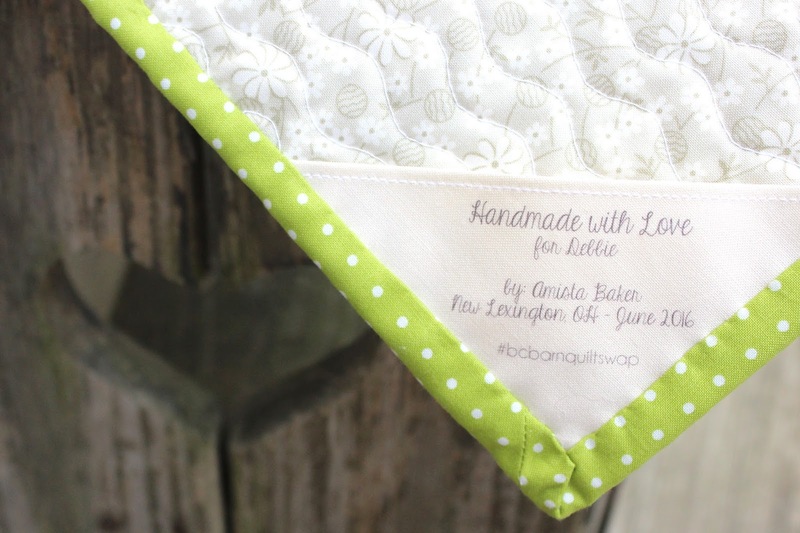 :) Printing the fabric labels was much much easier than I had expected it to be, you should definitely give it a try! What a pretty mini! I bet Debbie was super pleased with it. I made a little mini gift for a friend this weekend, but haven't shared it on my blog yet because I want it to be a surprise. :) They are fun and I can see doing many, many more in the future. She loved it, thank you so much! I need to make one for myself now, it definitely was fun! This mini is so adorable! I've never made one but making one for a swap sounds like fun. Thank you Jennifer! I loved making it, mini's are so addictive! This is so, so pretty! I love the label, I'm definitely using that! I am sure the recipient was super pleased - I know I would have been. Congratulations on the finish and thank you for participating in the 2016FAL, on behalf of all the hosts! Thank you Rhonda! The Finish-A-Long has been so fun!